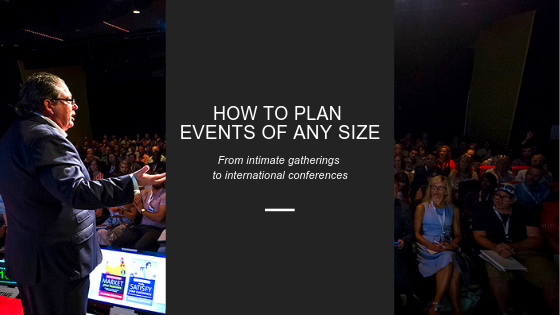 One of the trickiest things an event planner can encounter in any given week is how to plan events of different sized attendance groups. Anyone who’s ever put together a business conference, gala or party will know there’s a serious difference between hosting 30 people and hosting 300. So how do you go about ensuring your big event is the perfect size for your guests? Take a look at these helpful hints and get set to impress. here you should host your event. It’s likely the budget for your small event will be limited, so it makes sense to hire as much equipment as you can, rather than buying it. Hire any AV equipment you need, such as projectors for slideshows and microphones for guest speakers, and spend the money saved on things like food, drink and educational resources for your guests. You may also need to gain a permit for your event if you’re hosting 50 guests or more. If your event is this size, you’re not alone. Between 100 and 200 guests is the average attendance rate for corporate events, according to a survey by Planning Pod, and catering to all these people is no easy task. Large-scale events may require more impact and spectacle, which can be delivered with the help of professional event lighting. Consider unique ways to light up your dance floor, whether it’s with a roaming spotlight or classic disco ball, or use subtle uplights and colour washes to add some punch to your business event. Bigger events will also need better sound, as it’s harder for sound to travel over large groups. Hire some heavy-duty speakers and sound systems to ensure your music and speakers are all heard amongst the throng. When hiring audiovisual equipment don’t forget to invest in an AV production specialist to help you create a seamless experience. You want to focus on the guests and the guest speakers not on making sure the sound is loud enough, the lights are turned down when videos are playing or that the presentation slides fit the screen. Pro Light & Sound are an audiovisual production company that delivers more than just AV. The Pro Light & Sound production team are event specialists and can help you navigate the whole event delivery process from concept to ROI. Get in touch with a Pro Light & Sound expert today to see how we can help you create a remarkable event for any audience size.